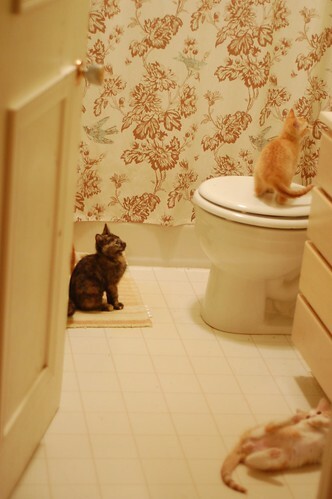 The kittens have discovered the bathroom. There's SO much to do and see in there: toilet paper to unroll, shampoo bottles to knock into the tub, a garbage can to rustle through, and a sink, oh joy, a sink. 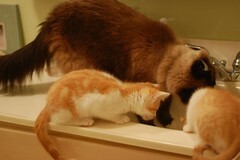 While the boys were wrestling in the sink this morning, Charlene jumped up and joined them. 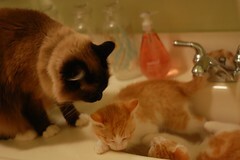 "The sink is not for wrestling, kittens. Let me show you what it's all about." This reminds me that I've heard from a friend (but never seen, hint hint) that kittens + bathtub + ping pong ball can provide hours of cheap entertainment! Charlene's floof melts my heart!!! 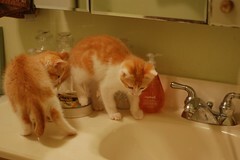 its a pretty bathroom and the kittens look pretty playing in it. i think ms bean is going to miss this gorup when they go to their homes this weekend. i know i will. Aww... the kittens are getting a few final lessons in How To Be An Awesome Feline from the Bean before they go to their forever homes. I don't know how you manage to let them leave, but for the sake of the future litters who'll get the benefit of being cared for by you and Charlene I'm glad you can. Oh my gosh! What cuteness ! Love your pictures. Ok, I've completely melted into a puddle. I so love how the Bean is there for each round of kittens - these little ones are going to be awesome cats thanks to the great start they got from you-all! See what happens! The day I can finally slow down enough to look at my very favoritest site in the world, I get treated to bathroom hijinx with The Bean & Babies. So cute! I love the little Draper (can't tell if it's Perry or Gordie) rolling around on the floor in that first picture. Oh joy! There is nothing more fun than catching those elusive little water droplets. :D SO SO cute!!! 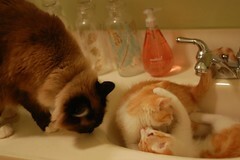 Sink full of kittens...most enjoyable! Hmmmm.... I am liking Kathleen's suggestion above. 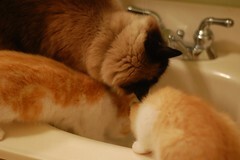 Kittens + ping pong ball + bathtub... indeed! sillies, the sink is for sleeping in! I can't believe those pretty glass bottles survived! I love these Drapers! And the Bean, of course! Looks like fun to me! Love the new website graphics, by the way!! So fun! Every single room in your house looks so gorgeous and sweet. With or without kitties although they certainly add to the decor big time. 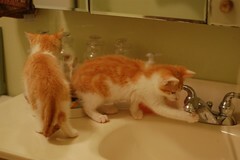 Kittens in the sink are cute, but I love those glass bottles! My two new babies are enjoying epic games of bathtub soccer, thanks to Laurie's suggestion a few litters ago. I threw them into the tub with a ping pong ball and a few stuffed mice.. Oh lordy. You'd think that they'd died and gone to heaven. Such. Fun. And all thanks to the Itty Bitty Kitty Committee! I love your photos! Was the water dripping in the sink? Wheeee! What gorgeous images and sweet adventure for the Drapers to have with Miss Butterbean. Great pictures. I'll be sad to see them go. You did a fantastic job with them, as always. My cats wait outside the shower when I'm in there. 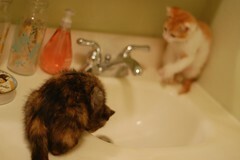 Only one plays with the bathmatt. The others wait for me to leave so I can feed them. I shall be so sorry to see these kitties move out. They are gorgeous, extremely so. So cute. We love the itty bitty kitty posts ~ they make us smile every single time! Adorable. Charlene is such a good auntie, teaching the kids important life skillz. Sinks!!! today's our last day with the Drapers isn't it? *sniff* Don't worry about us little ones, we'll miss you but will be alright, knowing that you've moved in with your forever families. Hugs all around. 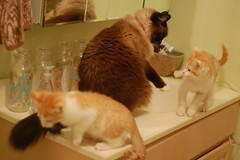 Kitties + bathrooms = too much fun! I, too, love seeing the Itty Bitties in context (next to Charlene, on Dad's lap or Grandpa's shoulder) so I see just how itty they are. 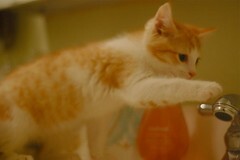 Kittens do love bathrooms, and so do adult cats, as Charlene so ably demonstrates. Adorable! 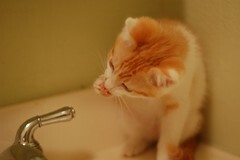 I still have a 17+ year old girl cat who insists on having a relatively constant drip of water out of our tub faucet. She drinks, she plays, she walks around with a wet head. Why can't we all be so easily amused and satisfied???? Those photos are wonderful!!! I especially love the little guy licking his paw. So, so cute.